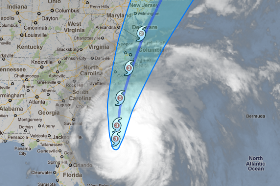 Hurricane Irene has its sights set on the East Coast, and that has easterners checking websites and mobile apps to stay up-to-date on its progress. The Weather Channel has already seen increased traffic this week to Weather.com and its mobile information sources, with 8.1 million page views to its mobile outlets alone on Tuesday and 9.7 million on Wednesday. Trade publication Broadcasting and Cable reported late yesterday that Weather.com was on track to reach between 90 and 100 million page views for Thursday alone. The Weather Channel's social tools also keep track of certain weather-related tweets on Twitter. This morning, the greatest number of weather tweets were coming from cities in the current projected path of Irene, including New York, Washington, D.C., Philadelphia, and Boston. 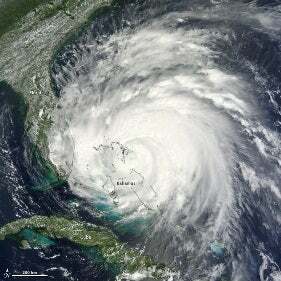 Twitter may not be the best source for solid information on the hurricane, however, since the microblogging site is overflowing with the phrase "Irene's wrath" and scary-looking satellite photos of the storm. It may also be a good idea to be wary of any automated calls to your phone telling you to evacuate. Residents in parts of Maryland recently received robocalls telling them to pack up. Authorities say the calls are fake. Here are some more-reliable sources of information. The National Hurricane Center: The National Weather Service's official hurricane site has tons of up-to-date information and data. Maps show where storm surges and hurricane-force winds are most likely to hit, and the NWS constantly updates watches and warnings at an impressive level of detail--right down to the zip code. This site is also the source of the data that many other sites and apps post. including watches and warnings, storm surge potential, and (most useful of all) evacuation routes. Local TV and news sites: Local media are often the only places in a given city equipped with state-of-the-art radar and other weather-watching equipment. Television stations in cities like Charleston, South Carolina, and Washington, D.C., which could be among the first hit by the storm, are good sources of first-hand information, as are network sites like CNN.com and Fox News. Mobile apps: Apps like the one from the Weather Channel and Hurricane Tracker HD provide on-the-go storm tracking and just about as much information as you can find on the traditional Web, so long as cell phone service remains available when the storm draws closer. NASA's Earth Observatory: If you want to see scary satellite photos, and a handful of other incredible shots, this is the place to go. Ready.gov and RedCross.org: To make sure that you're prepared for what could be a long weekend on the East Coast, check the recommendations at FEMA's Ready.gov site and at the Red Cross. Be sure to consult the hurricane preparedness checklists--and good luck!